In its formative years, Formula DRIFT provided a full track demonstration of drifting skills for spectators at the Grand Prix of Long Beach street race. However, the format was changed about four years ago to better reflect a competitive drift event. Taking place in the evening under the lights, it was the first time in the history of GPLB that a support series was held at night. Known as the Motegi Racing Super DRIFT Challenge, it continues to entertain race fans at the Acura Grand Prix of Long Beach. Jeff Jones has long become a staple in the Formula Drift landscape but many people are ignoring his pure social media gold these days along with a great determination to compete! Jeff Jones is the best underdog in drifting who spends the weekend wrenching on his own car and goes out swinging against the big boys of drift. LONG BEACH, CA – Coming off a superb 2018 season in which Team Falken celebrated its second consecutive Black Magic Formula Drift Pro Championship with two-time overall winner James Deane, the 2019 season opener in Long Beach was no different as Team Falken Driver Aurimas “Odi” Bakchis took the top rung Saturday night, April 6th, before a capacity crowd, signaling the start of yet another championship run for Falken Tires. 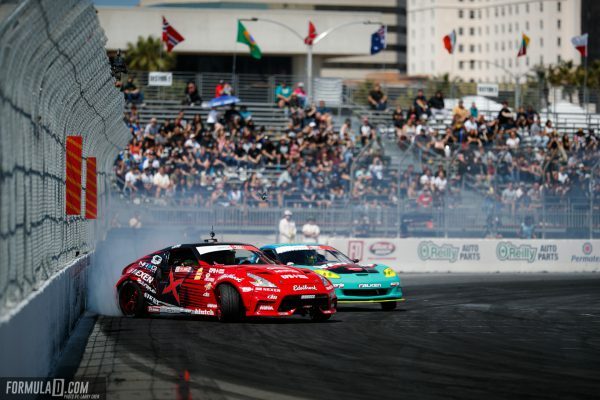 LONG BEACH, California (April 8, 2019) — Papadakis Racing and the Rockstar Energy Drink / Nexen Tire Toyota Corolla Hatchback earned a fourth-place result at the Formula Drift season opener on the Streets of Long Beach this weekend.